 WMF cookware sets – equip yourself like a professional! Wide pouring edge for drip-free pouring. Stackable - for space saving storage. Pan sets are a must for those who love cooking, as lots of cooking generally means lots of pans. Basic essentials include a few proven favourites combined with a wide range of other WMF pans in various sizes. The three-, four- or five-piece pan sets consist of deep/shallow casserole pans and stockpots with lid, a saucepan as well as a frying and serving pan without lid. And those who simply can’t decide can cater to their personal culinary preferences and choose the right size pans to fit their hob. Individual pots and pans from the cookware series can be added to the WMF pan sets at any time. Made from easy-care, robust Cromargan®, all pans feature a TransTherm® universal base and are thus suitable for use on all hob types, including induction. Small pots, great pleasure – this is the motto for the Silit miniMAX collection. The innovative technical features of these iF Design Award-winning pots and pans include ovenproof hollow handles, glass lids and non-porous, nickel-free** Silargan® surfaces. The deep casserole pan and stockpot with lid and the frying and serving pan are between 14 and 16 centimetres in diameter, making them ideal for single-person households or those with a small appetite. Their extra-strong steel core conducts heat quickly and directly, saves energy when cooking and is perfect for use on all types of hob, including induction. The meat and vegetable pan with lid and the frying and serving pan are also perfect for storing and quickly heating up leftovers. The 3-piece cookware set in the colours Energy Red and Black can be cleaned in the dishwasher and are stackable for space-saving storage. Silit gives a 30-year warranty on the inner and outer ceramic Silargan® surface if the product is used as intended*. * The 30-year warranty is guaranteed for the inner and outer ceramic Silargan® surface of the cookware. The warranty applies only if the product is used as intended. Further details about the scope of the warranty declaration and proper use can be found in the instruction manuals enclosed with the products. ** Nickel-free inner and outer ceramic Silargan® surface. With a cookware set you can process your order all at once. Our sets are thoughtfully put together and are suitable for stocking up on cookware or fitting out a new kitchen. Which pot you use when cooking a dish depends on two factors. Firstly it depends on the type of food you are preparing, and secondly the amount. Our cookware sets are designed so that you always have the right pot or pan available for the job. From our small low casserole just 20 cm in diameter to our high casserole in various sizes and our saucepans and frying pans, all the most important pans are available in the WMF cookware sets. Each pot is delivered with a matching lid – either in glass or metal depending on the set ordered. Milk pots are exceptions to this as they don't have lids. Some of our sets also come with fewer lids than others. In any event, buying one of our cookware sets will leave you well equipped and ready to enjoy your cooking! High quality and sophisticated technology are important in turning cooking into a joy and making sure your dishes turn out well. That's why our pans are made of Cromargan® and some pots have a TransTherm® universal base. Some of our cookware sets have thermally insulated handles which make pan holders almost unnecessary. Lids are either made from Cromargan® or from high quality oven-proof glass. Because of this you can use our pots for frying and not just boiling. If you want to reduce the number of dishes and bowls used at the table but still prefer a nicely laid table, our finest cookware sets, for example from the Concento or Trend collections are the right choice for you. Become a masterchef with a WMF cookware set! The wide choice of pots and pans available either in our cookware sets or as individual pieces lets you kit out your perfect kitchen. This means that even the enthusiastic amateur can prepare dishes like a professional and throw the perfect dinner party! A neatly laid table can make any meal refined, with the cutlery, place settings and pans all going together. We wish you a successful and fun cooking experience and bon appetit! WMF pots – helping you cook even better! The better the cookware, the tastier your dinner! Cooking is no different to any other household task: the better the tools, the easier it is to get good results. When it comes to pots this advice should particularly be taken seriously. The right cookware makes cooking a real joy! Every pot is different – take your pick! Nowadays any chef, whether amateur or professional, can choose from a wide range of pots. Differences in shape, construction and material make each WMF pot specially suited to its intended use. Individual models are available in different sizes, and needless to say each pot comes with a matching lid. In the WMF assortment you can find high casseroles and low casseroles as well as milk pots, pasta pots, stock pots and asparagus cookers. Our cookware is constructed in various shapes to meet the respective demands of different meals. This saves energy, preserves the taste of the food and makes sure that cooking never stops being fun. Items from our special cookware range like saucepans or simmer pots are also available in different designs. In the WMF product range, pots are not only available to buy individually but are also available in a number of different sets. A cookware set consists of sets of various sizes and purposes, which come with metal or glass lids depending on the set. Our sets not only ensure that you have more pots to hand but also add a touch of beauty and quality to your kitchen. The different collections implement design features in every pot in each set. Of course pots from the Astoria, Diadem Plus or WMF Inspiration ranges can also be acquired individually or in combinations of your choice. Try out our cookware customising tool! WMF pots and pans are made to a high standard using Cromargan® stainless steel 18/10. Together with the special Sandwich or TransTherm® base models you can cook delicious food in any cookware from our assortment. That's why so many professional chefs swear by using WMF pots in the workplace. Browse our wide range of pots specially made for cooking absolutely any kind of meal! Experience the sophisticated WMF Concept range, which is the result of many years of experience and extensive research, not only for the different types of pots!